At first blush, I thought this would be relatively easy. I needed some idea of how far it was between these major trunk segments so I would know how long my treehouse beams could be. Or, as it turned out, where I could put 16-foot lengths so they’d actually reach; again, the sheer immense size of the tree fooled me. But to measuring: it wasn’t going to be straightforward. 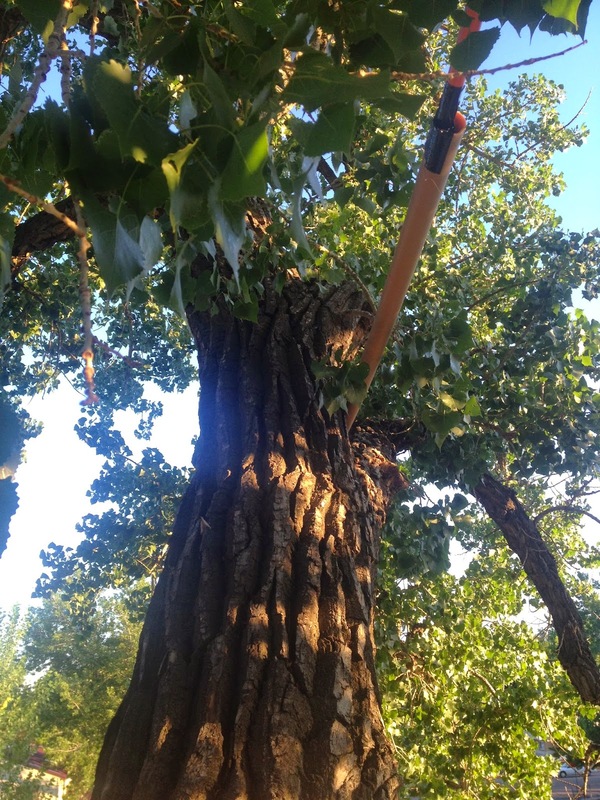 There was no way to extend a tape measure where it needed to go — between branches and, well, a dozen feet or more out — and there was no chance of getting a helper up into the tree. I had a pole saw that extended to 12 feet, and an 8-foot length of PVC pipe I could duct tape to one end. I used a sharpie and marked one foot increments along the inner half of the pole saw — so I could find a relatively level run between branches, and see how long it needed to be to get there. Totally level. Or at least mostly. Through sheer luck, and a lot of clambering around in the tree, I discovered it looked really likely I’d be able to run two 16-foot treehouse beams (2x12s) on either side of the main northern and southern branches. This was great news, tempered (a little) by the discovery that the only place to make that happen was nearly 30 feet off the ground. It sunk in: the floor of the treehouse I was building for my 5 year-old daughter was going to be 30 feet in the air. I needed to make this thing safe, safe, safe.